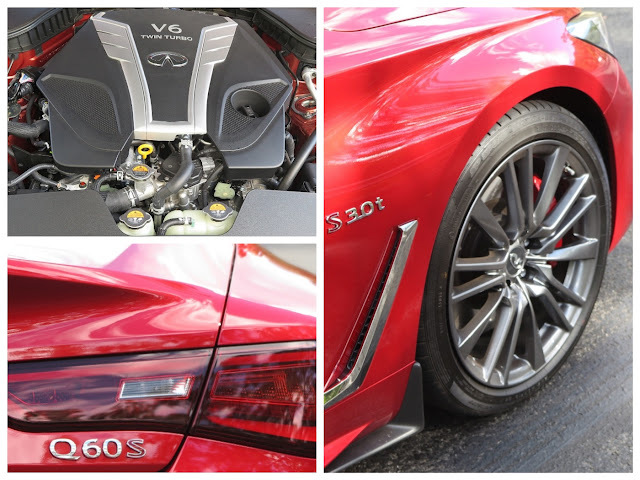 drivingandlife: INFINITI Q60 S Red Sport - A BEEFIER, BETTER Q? Matter of opinion of course. I want to be upfront. 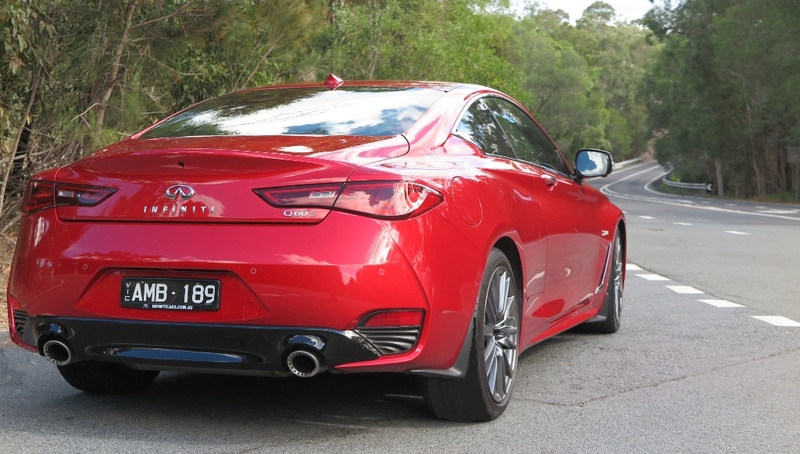 If you’re spending AUD$90 grand, the topline Infiniti coupe can be yours – but if it were me and money no object then I’d willingly lash out a few hundred dollars more on the monthly lease payment for a Jaguar F-type coupe. I guarantee the British-bred coupe will deliver the extra bucks in its performance delivery, its drivability and it’s lithe alloy-bodied beauty. 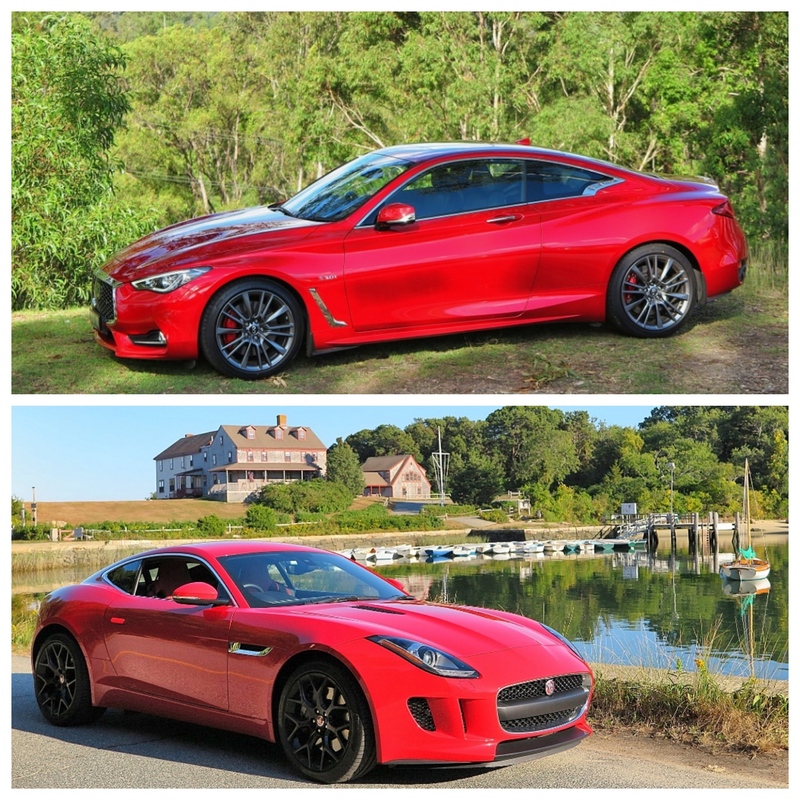 The Jaguar's suspension and ride quality is also way, way better than the Q60. The smaller-engined Q60 coupe, offering the Mercedes-Benz 2.0L turbo four is a better-balanced machine than the beefier behemoth. The big brother is all brawn, all bells-and-whistles, and not a lot of subtlety. 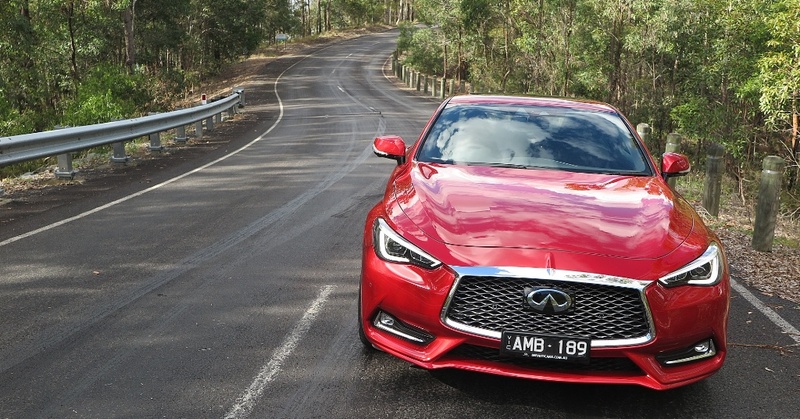 Driving on curvy, sharply undulating regular country roads, the Q60 S bucks and dives, and just about rips your arms off – when all the driver aids settings are on track max. This car would be excellent on a track day, but somehow I can’t see this Infiniti being circuit bound. Interestingly, an old friend who works for the Infiniti dealer in Hong Kong tells me the Q60 S is their biggest seller. If you’ve ever driven in Hong Kong, you’ll know just what a ridiculous choice this is – unless the owner is just a poseur. The (Nissan-derived VR30DDTT) Infiniti 3.0L twin turbo V6 pumps out 298kW (400 hp), compared to Jaguar’s 280kW (375hp), but Jaguar’s delivery is more linear. Both drive the rear wheels, via paddle-shift transmissions. Q60 S has a 7-speed; while Jaguar's is a ZF 8-speed box. Set the Infiniti on ‘comfort’ settings and it’s acceptable; it’s not a car I enjoy driving with verve and brio. The ‘lane keeper’ technology tends to make the car ‘yaw’ from side to side, so I turned it off. One of the most annoying aspects of this car is the poor resolution of the touchscreen/nav/entertainment/info systems. Yes, systems. 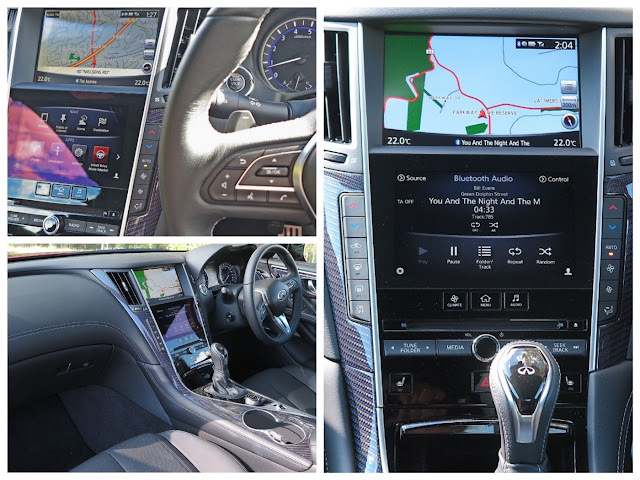 Because, you have to navigate through three different screens – one in front of the driver, one on top in the centre for the GPS, and the lower one for media/Bluetooth/drivers aids etc. Talk about confusing. There’s definite evidence this is a car designed by ‘track boy’ engineers, who handed over the beast for its cabin fit-out and the interior team just threw in what was on the shelf – as opposed to integrating the systems. As for design, all Infinitis to date were designed by Alfonso Albaisa, and quite frankly I think he’s one of those designers who doesn’t quite know when to stop drawing ‘flourishes’. Infiniti has recently named ex-BMW designer Karim Habib to lead future exterior design, so expect to see a theme change. My spies tell me Habib’s first product will be the joint Infiniti/Mercedes-Benz compact sedan to come from the Alliance’s new Mexican plant. All up, if you want the sort of performance that comes from the AMG, BMW-M, Jaguar SVR models, then the Q60 S Red Sport is a bargain – but in the valet parking lot, it doesn’t come close to the Europeans for style, caché and sophistication.